Stick Prince, a powerful combination of 3000mAh battery and TFV12 Prince tank, is born to be a legend. It is newly designed, with a special hexagon power button and a carefully carved battery base you can feel how exquisite it is. Stick Prince's large battery capacity is the best guarantee for long time vaping and LED indicator on its body can tell you the specific conditions of itself. The TFV12 Prince tank has 8ml capacity and hyper engines, which can bring you massive vapor. Besides, the tank's patented locking mechanism can effectively solve the leakage problem. Innovation keeps changing the vaping experience! 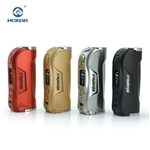 The WarWolf by HCigar is a slim, stylized vape mod powered by a single 18650 cell (not included) and XT80C chip set, that delivers up to 80W of power. The device accomodates atomizers up to 25mm wide with no overhang, and has full temp-control support for Ti/Ni/SS. The hinged bottom battery door maximizes compact design making the WarWolf slender and pocket friendly. Ergonomic shaping makes the device comfortable to grip, and the large firing button is easily pressed with your finger or thumb. The micro USB port supports firmware updates and 2A charging; however, an external charger is recommended. Powered by the ATHEON chipset, the Oceanus mod is a tidal wave of intuitive features. Powered by a single 20700 battery, the Oceanus is one of the newer devices to use 20700 sized cells. Charging batteries within the Oceanus can be done through the micro USB port, which features an integrated quick charge system that is capable of charging batteries at 2 amps. The Oceanus is equipped with an OLED display that will automatically rotate depending on the orientation of the mod. With a full wattage range from 6.0W to 110.0W, users have a wide range of power to play with and experiment to find the best settings to use with their atomizers. Comes with mod and two batteries. Must choose med. flat rate shipping to purchase this item. The Geekvape GBOX Squonker box mod is a stunning squonk device to Squonk lovers, integrating a squonk-ready system with a high performance AS chipset, which is capable of delivering output power of up to 200W. GBOX has full temperature control with TCR adjustments. It comes with built-in squonk bottle with 8ml juice capacity. The mod is powered by dual 18650 batteries (not included). Please Note: The max. output is 80W in TC mode. 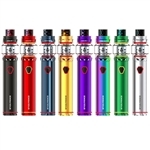 Uwell Nunchaku Tank Vape Kit is the first vape Mod Kit from Uwell. Power by single 18650 battery that Max output can up to 80W. Features the innovative fire button that is convenient to switch the multiple modes. The ventilation hole of the battery door provides the anti-overheating protection. Also, the battery indicator on the screen will bring the intelligent experience. Working with the brand new Nunchaku tank and the easy plug-pull coils, the Uwell Nunchaku Tank Kit will bring the chase cloud vapor. Uwell Nunchaku Tank 80W TC Vape Kit is as powerful as mech mod and as safe as the box mod!